Angela Murphy is a Post-Doctoral Research Fellow at the University of Southern Queensland, Toowoomba. She is currently working on a three-year USQ-led Collaborative Research Network (CRN) project with ANU and UniSA to develop a Mobile Learning Evaluation Framework. This project will develop resources to support leaders and practitioners implement sustainable and transferable mobile learning initiatives within multiple higher education contexts. Angela has more than eight years’ experience in project management, research design and analysis and has managed a number of large scale projects across multiple industries in the corporate, government and academic sectors. Though universities are eager to leverage the potential of mobile learning to provide learning flexibly, most balk at the cost of providing students with mobile hardware. The practice of ‘bring your own device'(BYOD) is often mooted as a cost-effective alternative. This paper provides a snapshot of student ownership of mobile devices at a regional Australian university. Our research shows that students do have access to and use a wide range of devices. However, the delivery of learning is challenged when students try to access materials and activities using these devices. Course materials are rarely optimised for use on smartphones, navigating websites and learning management systems becomes a scrolling nightmare, and interacting with other students is often impractical using prescribed systems. Most concerning is that none of the students surveyed were participating in educator-led mobile learning initiatives. The paper concludes with the proposal of some practical, low-cost tactics that educators could potentially employ to begin engaging with mobile learning, leveraging what students already do. The viability and suitability of mobile learning is a topic of intense debate in Australia, where 65 per cent of people own a smartphone, 37 per cent own a tablet, and around a third of the population owns both (Deepend 2015). Younger people are more likely to own smartphones, with some 86 per cent of people in the 18 to 24 year-old age group and 91 per cent of people in the 25 to 29 year-old age group owning at least one (Deepend 2015). In Australia, making phone calls is not the only purpose of a smartphone; they are also frequently used to check email and to access social media (Deepend 2015). As a result of the incremental improvements in design of mobile devices, these technologies are increasingly perceived as essential in people’s everyday lives (Evans-Cowley 2010). Given the high levels of smartphone ownership and use among student-aged people, universities have been slow to leverage mobile device ownership to facilitate learning. (Alrasheedi and Capretz 2015). Significant commitment at the infrastructural, pedagogical and leadership levels would be necessary in order for institutions to fully engage with mobile learning (Farley and Murphy 2013). The provision of mobile technologies to students across a university is costly and can be accompanied by a range of infrastructural and maintenance challenges (Russell and Jing 2013). Maintaining security of the institution’s networks and enabling access by many kinds of device, challenges university IT departments to the point where some simply disallow access by certain types of device and operating systems (Du and Lin 2012). This is an issue also faced by commerce and industry, where employees are permitted and enabled to use their own personal devices for a mixture of personal and employer business (Rose 2013). In universities, BYOD also results in other significant challenges, including the need to revise technology support or internet access policies (Kobus, Rietveld & van Ommeren 2013). In order to explore these issues, focus groups and online surveys were conducted with several hundred (n = 749) distance and on-campus students at a regional Australian university, the University of Southern Queensland. Findings indicated that students were actively using mobile technologies such as smartphones and tablet computers to support their learning, but current learning systems, ICT infrastructure, and teaching practice did more to hinder than to help. At the time of the research, the university systems were unable to cope with the variety of mobile devices and operating systems used by students, and the ways that students used them to support learning were poorly understood. Educators intrinsically mistrusted student-led use of mobile devices in face-to-face contexts, and some went as far as forbidding device use in class. However, with more understanding of the extent of student access to mobile technologies and the ways in which students support their learning with them, educators may become more willing to consider the introduction of mobile learning initiatives. A number of potential, entry-level tactics for educators are proposed in light of these findings. Though the benefits of mobile learning are well-documented, educators are still reluctant to implement mobile learning initiatives in their teaching (Alrasheedi and Capretz 2015). Financial constraints are often cited as one of the reasons they have not been extensively adopted. The cost of purchasing devices for use by staff and students can be prohibitive (Crompton 2013). In addition, data privacy concerns are also increasingly commonly cited as an issue. Recent research suggests that as many as 60 per cent of mobile apps send information about users to app developers or third parties (Crompton 2013). Educators may feel that they have to change their teaching style in order to accommodate mobile learning and many are unwilling or unable to do that (Crompton 2013). Given that substantial changes may have to be made to incorporate mobile learning into teaching, many educators cite time pressures as limiting their adoption of mobile learning (Crompton 2013). Some time ago, Hew and Brush (2007), found that there were some 123 barriers to the adoption of mobile learning that could be roughly grouped into six categories: 1) lack of resources such as technology, time and technical support; 2) a lack of knowledge and skills including technology-supported pedagogical knowledge and technology-supported classroom management knowledge; 3) issues at the institution including a lack of commitment by leadership, timetabling issues and planning; 4) teacher attitudes and beliefs; 5) difficulties associated with assessment such as the pressures of high-stakes testing and standardization; and 6) non-conducive subject culture whereby educators are reluctant to adopt a technology that is not normally associated with the teaching of that subject or discipline (Lai et al. 2007). Though this study was written just as the iPhone was first appearing on the world market (Terada 2012), all of these factors remain as significant challenges, frequently reported in the literature (for example, see Terras and Ramsay 2012; Power 2014; and Sharples 2013). A report conducted for the Joint Information Systems Committee (JISC) e-Learning program in late 2010 indicated that the most prominent issue in the field of mobile learning is the lack of full scale evaluations of mobile technology in higher education (Wishart & Green 2010) and the absence of a stable platform from which to effectively research the role, drivers and impact of mobility on learning (Park 2011). Several attempts to conceptualize mobile learning have been made (e.g., Traxler 2007; JISC InfoNet 2011; Pachman, Logunov, & Quinton 2011; Vavoula & Sharples 2009), yet none have been sufficiently targeted to ensure comprehensive and rigorous coverage of the rapidly developing and changing landscape of contemporary mobile learning networks and technologies. A project underway at the University of Southern Queensland will aim to address this gap by developing an effective evaluation mechanism that can be used to determine whether or not particular mobile learning initiatives are viable, scalable and replicable. A Mobile Learning Evaluation toolkit: a set of principles, procedures and methods that can be used to promote the collection and review of information related to new mobile technologies, the objective evaluation of mobile learning initiatives, and prioritisation of proposed investments in mobile learning within various learning contexts. The research results and tactics for educators presented in this paper are drawn from the first phase of this three-year project. This project is funded through an Australian government Collaborative Research Networks (CRN) project led by the Australian Digital Futures Institute at the University of Southern Queensland in conjunction with the Australian National University (ANU) and the University of South Australia (UniSA). Students studying on-campus and via distance or online mode at the University of Southern Queensland, a large regional university, were approached to participate in an online survey as well as a series of face-to-face focus groups. The aim of the research is to provide the project team with insights into how university students perceive mobile learning, the types of informal mobile learning they undertake, the mobile technologies they own or access and their mobile learning preferences. A university ethics application was submitted and approved whereby students were under no obligation to participate in the research and were free to withdraw without penalty at any stage. A quantitative online survey was developed in April 2013 in response to a gap in understanding of the prevalence and nature of mobile technologies available to students enrolled at the University of Southern Queensland. Progress in the development and implementation of mobile learning initiatives at the university has up to now been hindered by perceptions that such initiatives would disadvantage students who do not have access to mobile devices, particularly students from lower socio-economic status backgrounds or students who study at a distance; this is a common concern of educators (Handal, Ritter, and Marcovitz 2014). The survey was designed to identify whether these assumptions were accurate or whether the university would more readily be able to adopt mobile learning initiatives that rely on students bringing their own devices. The survey consisted of four sections: 1) student demographics, 2) the availability and quality of internet access, 3) ownership and access to mobile devices, and 4) usage of mobile devices by students to support learning or study. To enable comparison, questions were asked about both mobile technologies such as smartphones and tethered technologies such as desktop computers. To ensure that students only completed questions about technologies that they owned or actively used, questions about learning activities engaged in by students were filtered. The survey was administered online using the survey tool, Qualtrics. Students were notified of the study via a notice placed on the university’s student-facing website. The survey data were collected between March and May 2013. The survey was followed by online and on-campus focus groups held in June and July 2013. The data presented in this article is drawn from a subsection of the questions from the quantitative online survey. The results from the external focus group are not explicitly presented, but specific examples may be drawn out from those transcripts to illustrate specific points. A final sample of 749 students participated in the online survey which consisted of 489 external students (66%) and 256 (34%) on-campus students. Undergraduates made up 82% (612) of the sample and 18% (135) were postgraduate students. A third of the sample consisted of first-year students (189, 31%). The sample consisted of more female participants (511, 68%) than male (237, 32%) and the age range of students was between 17 and 73 with a mean age of 32 (SD = 10.29). Furthermore, most of the participants were employed in addition to studying (534, 71%), working a minimum of 3 hours and a maximum of 85 hours a week (M = 30, SD = 13.88). The characteristics of the sample are presented graphically in Figure 1. Characteristics of University of Southern Queensland student survey participants. One of the arguments against the implementation of BYOD policies in higher education institutions (HEIs) is the potential disadvantage to students who do not have access to mobile technologies (Handal, Ritter, and Marcovitz 2014). Findings from the current research study presented in a separate paper (Murphy, Farley, Lane, Hafeez-Baig & Carter 2014), identified that only a very small proportion of students do not own or have access to a smartphone (<5%) and most students have more than one mobile device. Ownership of or access to tablet computers is widespread with only 29% of students reporting that they could not access one, a number which will decrease as these devices become cheaper and more widely available. Figure 2 presents data from the survey about the types of operating systems used by students on their smartphones or tablet computers. The figure shows that the tablet computers used by students in the sample mostly have Apple iOS operating systems (57%), yet smartphones are nearly equally split between Apple iOS (52%) and Google Android operating systems (44%). Operating systems used by student users of smartphones and tablet computers at the University of Southern Queensland. Further analysis was conducted using chi-square tests to determine if there were any differences between different classifications of students and their access to mobile technologies. Differences in usage or ownership of mobile technologies by students (students could own a device, have access to a device or not own or have access to a device) was assessed against eight demographic questions; the student’s gender (male or female); mode of study (on-campus or external/distance mode); undergraduate or postgraduate study; first year of study (yes or no); fulltime or part-time study; employed in addition to study (yes or no); country currently living in (Australia or other); and language mostly used at home (English or other). The option for whether a student owned or had access to a device was collapsed into one category to simplify interpretation of the results. The results are presented in Table 1. Technology ownership by different USQ student demographic characteristics. *Sig differences p < .05. Which of the following modes are you currently studying in? Is this your first year studying at university? Are you currently employed in addition to studying? Which country are you currently living in? Access to smartphones and tablet computers is high across all groups of students, although several significant differences are apparent. Students studying on campus were significantly less likely (89%) to have access to a smartphone compared to students studying externally or online (95%, X2 (1, n = 749) = 10.481, p = .001). First-year students (90%) and students who were unemployed (89%) were also less likely to have smartphones than those in later years (95%, X2 (1, n = 749) = 4.22, p = .04) or employed students (94%, X2 (1, n = 749) = 6.106, p = .013). Access to tablet computers was also found to be more pronounced among employed (82%) compared to unemployed students (65%, X2 (1, n = 749) = 5.556, p = .018). Students from non-English speaking households (44%) are however significantly less likely to have a tablet computer as compared to students from households that speak mostly English at home (73%, X2 (1, n = 749) = 16.118, p = .000). These students do, however, appear to have equal access to smartphones. What many higher education institutions fail to take into account is that the majority of students not only have access to these technologies, but are actively using them to support their learning (See Figure 3). Further analysis of student demographics revealed that students were equally using smartphones and tablet computers to support learning and only employed students are more likely to use tablet computers compared to unemployed students (59%, X2 (8, n = 532) = 29.573, p = .000). Analysis of an open question about locations where students use smartphones and tablet computers to support learning revealed that these technologies enabled students to learn in environments outside of the traditional physical campus or home study locations. Students were able to leverage these technologies to learn in a truly mobile manner and use these technologies to take advantage of spare moments within their daily routines (see Figure 4). Students report using these devices for a range of activities that we classify as scheduling, administration, collaboration, information recording, information searching, and information consumption (reading, watching and listening). Details of these activities were discussed in an earlier article by the authors (2014). 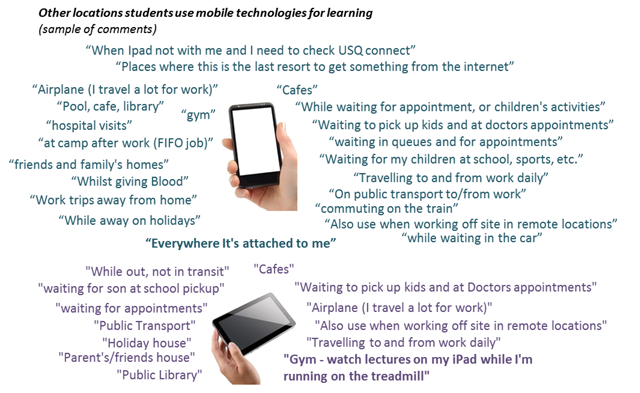 Use of technologies owned or used by USQ students for learning purposes. Locations where students use tablet computers and smartphones for learning. When asked a number of attitudinal statements about preferences for mobile learning, 87% of students were in favour of using their mobile devices to support their learning either in class or at a distance. Only 18% of students felt that they did not want to use their mobile devices in class or as a part of learning as their technologies were specifically for personal use, such as staying in touch with friends or family. There were no significant differences found between any of the previously discussed student demographic groups on these two attitudinal statements. Even though it was obvious that students were using their mobile devices for learning, there were no examples of educators actively enabling or facilitating mobile learning in their courses. Survey participants were asked about the types of activities used by lecturers in the classroom that were designed to engage students. Discussion forums were used most extensively (94%), followed by pre-recorded lectures with PowerPoint slides (90%). Activities used less frequently by lecturers included using wikis (39%), instant messaging (38%), podcasts (34%) and blogs (33%). Although 61 per cent of students indicated that they accessed course materials in class using tablet computers, this is simply students using tablets to access course materials, rather than the active educator-led use of tablet technologies to engage classes (see Figure 5). Student experiences of learning activities available in courses. Further analysis revealed significant differences in the types of activities experienced by undergraduate, compared to postgraduate students. Undergraduate students were more likely to have experienced pre-recorded lectures with PowerPoint slides (92% vs. 79%, X2 (1, n = 592) = 15.152, p = .000), mini-recorded lectures or multimedia presentations (74% vs. 63%, X2 (1) = 5.619, p = .018), discussion forums (95% vs. 87%, X2 (1)= 11.021, p = .001) and self-marking quizzes (78% vs. 67%, X2 (1) = 5.814, p = .016). There were no significant differences in access to courses using mobile devices. Students were then requested to indicate which of the aforementioned activities would be most likely to improve engagement with their course on 5-point scale ranging from Strongly Agree (5) to Strongly Disagree (1) (see Figure 6). Those resources and activities considered by students to have the highest impact on improving engagement were pre-recorded lectures with PowerPoint slides (M = 4.23, SD = 0.91), discussion forums (M = 4.12, SD = 0.91), self-marking quizzes (M = 4.11, SD = 0.93) and access to course materials for tablet computers (M = 4.11, SD = 1.10). Mini-lectures or short multimedia presentations were also considered to impact strongly on engagement (M = 4.08, SD = 0.97), possibly as these activities would provide students with short snapshots of information that are easily accessible on mobile devices. Podcasts were considered by students to be less important (M = 3.50, SD = 1.11) although still highly desired by at least half of students. None of the activities indicated were optimised for use with mobile devices. 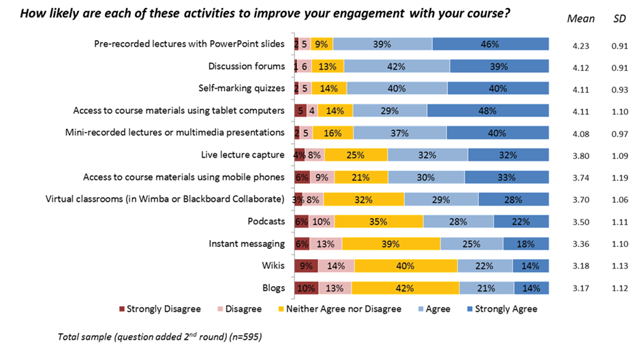 Engagement potential of learning activities within University of Southern Queensland courses. Students indicated that many lecturers at the University of Southern Queensland still favour traditional didactic methods, with few providing students with opportunities to interact with the lecturers or each other. Students that had recently graduated from high school, where many schools were already incorporating advanced technologies into classroom teaching, were often surprised by the lack of use of innovative technologies in university classes. Students reported that they would appreciate more interactive learning activities in class or via mobile devices that would enable them to experience real world problems related to their studies or future careers. For many educators, this task appears daunting. Consistent with the concerns of educators documented in the literature, many perceive they lack the expertise to introduce mobile learning or lack the time to learn how to do it effectively (Ismail, Azizan & Azman 2013; Ally, Grimus & Ebner 2014). An independent-samples t-test revealed that external students in particular had a greater preference for podcasts (M = 3.57, SD = 0.49) compared to students studying on campus (M = 3.35, SD = .26; t(562) = –2.18, p = .03]. This is a simple form of mobile learning which would enable them to listen to course lecture recordings while completing other tasks in their daily lives. 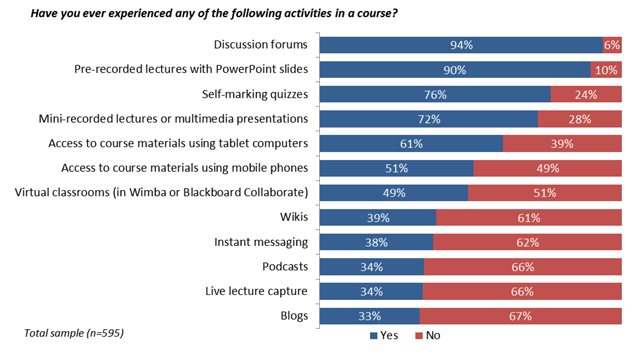 External students also noted a significantly greater preference for live lecture capture, mini-recorded lectures or multimedia presentations, discussion forums, self-marking quizzes and virtual classrooms (see Table 2). Differences in engagement potential of learning activities between students studying on campus and online. *p < 0.05. Given that students are already using mobile devices to support their study (see Figure 3), it seems the most efficient and easy entry into mobile learning for educators, lies in supporting what students already do. Students are often power users of mobile devices and don’t want to ‘power down’ when they attend university (Crompton 2013). The following entry level tactics were formulated as a result of the research. The following are eight small steps that educators could take, irrespective of the institutional environment, which could support students in using their mobile devices for informal learning. These steps require minimal expertise, take very little time and require very little support for students and educators alike. They do not require that educators engage with institutional IT departments, access extra resources or require additional technical support. The informal polling of academic teaching staff at the University of Southern Queensland reveals that many believe that mobile devices distract students during face-to-face tutorials, lectures and practical sessions. However, a literature is beginning to emerge around how students actually use their devices in these settings. Gehlen-Baum and Weinberger found that students frequently browsed lecture-unrelated websites, played games, involved themselves in social media and watched videos during class (Gehlen-Baum & Weinberger 2012). This echoes the findings of Tindell and Bohlander who also added text messaging and sending pictures to those activities undertaken by students during class time (Tindell & Bohlander 2011). What is becoming apparent, however, is that students are also using their devices for class-related activities. This was acknowledged by Gehlem-Baum and Weinberger (2012) who stated that students used their mobile devices for annotating lecture slides, taking notes, looking at lecture-related websites and looking at lecture-related documents. This literature forms the basis of the first of the proposed tactics: the use of mobile devices in class should be allowed and students should be encouraged to use them for learning purposes. In order to accommodate learning across a range of devices in a variety of contexts, course materials should be provided in a number of common file formats. 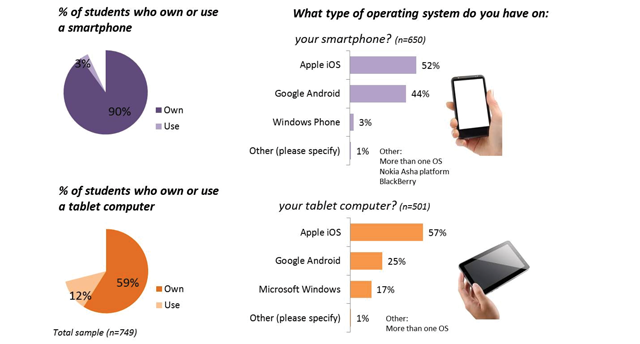 From the student survey, it was found that students used a variety of mobile devices using a range of operating systems (iOS, Android, Windows, Blackberry) (see Figure 2). Different operating systems may handle file types differently. For example, many versions of the iOS operating system could not process Adobe Flash files (.swf) due to a long running dispute between Steve Jobs and Adobe (Jobs 2010). For those students using laptop computers, materials should be provided as PDFs, or in the .doc, .xls or .ppt formats. Many students are using software packages that do not work with the Office Open XML formats such as .docx, .xlsx and .pptx. In addition, files presented as ePubs will enable easier viewing on devices with smaller screens or eBook readers as the text will reflow as the user zooms in or out (Marinai 2013). Even so, the conversion of files to ePub format can be difficult (Murphy, Martin & Farley 2012). To enable students to be able to annotate lecture slides (for face-to-face students) or to access notes when on the go or when grabbing portions of time opportunistically (face-to-face and distance students), notes should be provided in various formats that match the students’ study practices: not just in HTML, .doc and .ppt but also PDFs which can be annotated with many apps and can be used across various platforms and with various applications. Students are engaging with their study in multiple locations, often opportunistically (see Figure 4). It will not be helpful to record lectures as podcasts with those subjects that require complex formulae to be demonstrated and so on, but for most courses this would be useful. Podcasts allow students to make use of the time when they are on the go, moving between venues, while exercising, during a commute, and so on (see Figure 4). Again, podcasts should be provided in multiple file formats to allow use on a wide range of devices. An educator does not necessarily need high-end hardware to record podcasts. Most smartphones have a voice recorder and this will produce recordings of a sufficient quality for most purposes. In order for the learning management system (LMS) or a course website to be usable on a mobile device, it needs to be optimised for these devices. While many universities are making the LMS mobile-friendly, there are many that are still lagging behind. Though it is generally beyond the control of most educators to optimise the LMS or website for use on mobile devices, there are ways to ensure students have ready access to course materials via their devices. The most obvious way is to direct students to third party apps which are available across a range of platforms for specific learning management systems. Though these are rarely ideal, they do make it easier to access the LMS than through a non-mobile-friendly website. These apps include Blackboard Mobile Learn (for Blackboard) (see https://itunes.apple.com/au/app/blackboard-mobile-learn/id376413870?mt=8) or Moodle Touch (for Moodle) (see http://app.appsgeyser.com/Moodle%20Touch). A shared Google Drive or DropBox is another option to enable students to readily access course materials through their mobile devices. Both of these applications have mobile apps which allow them to be accessed easily. The other option is to link to them via a shortened url (for example bit.ly) or a QR code. Course files, in multiple formats, could be placed within these shared drives for ready access. Mobile applications or apps are small pieces of software, generally platform specific, that run on mobile devices. Their strength lies in the fact that they are specifically designed to accommodate the constraints (for example, limited processing power and small screen size) of mobile devices. Over half of the students surveyed at the University of Southern Queensland (53% of smartphone users and 56% of tablet users), already used apps for learning purposes. International students and students studying foreign languages other than English frequently use dictionary or language apps on their mobile devices, during class and informal study times to assist them with translating or understanding English vocabulary. There are a number of apps that can facilitate informal learning across a range of devices and platforms. Chances are, students will already be using some of these so by providing a space for students to share their own experiences and recommendations for apps will help both the educators and other students find useful apps. Such a space could also function as an informal support portal. There are a range of apps that could be used to annotate course materials, act as voice recorders, meeting organisers, provide access to cloud storage and so on. Even though over half of the cohort uses apps, appropriate or useful apps are identified almost randomly by students, through searching for them on app stores or by hearing about them from peers or educators. Specific subject-related blogs were also mentioned as a source for discovering useful apps. Students seldom encountered lecturers that actively promoted apps and indicated they would prefer that more lecturers included suggestions for apps in their courses, along with recommendations for newsletters, websites or other useful resources. Students are keenly aware that the reason why lecturers don’t recommend apps is because they are not aware of them and often don’t advocate the use of mobile technologies for learning. A quick search on the internet reveals that there are lists of apps for every conceivable discipline on every platform; from nursing to mechanical engineering, music and literary studies. Again, it would be useful to provide students with a space where they can recommend and discuss these discipline-specific apps. The use of social media, particularly Facebook, on mobile technologies for learning purposes, is a theme that emerged spontaneously during the initial focus group discussions and was integrated as a topic for discussion in the remaining focus groups. This correlates with what is emerging in the literature (Lampe, Wohn, Vitak, Ellison & Wash 2011). The majority of students in our focus groups reported that they belonged to one or more course-related Facebook groups set up by fellow students and used these groups actively. Students viewed Facebook, not only as a social tool for staying connected with friends and family, but as an essential tool for communicating and collaborating with peers in their courses. The extent of the use of Facebook groups to support learning was surprising; most students in the focus groups were aware of or participated actively in Facebook groups set up either for specific courses or at a program or faculty level. Facebook groups were often spontaneously set up and administered by students in the units or programs, either on the advice of the course facilitator (an uncommon occurrence) or without their knowledge. Most groups are managed by being set to private, and designated administrators will grant fellow students access on request to gain entry or remove a participant who is spamming a group. This ensures that all comments are private within the group and students are often protective about who they allow into these groups. Course administrators and lecturers are generally not welcome within these spaces. Course Facebook groups work well on mobile devices as there are Facebook apps available across all platforms. Students generally find it easier to access and use Facebook discussion boards, rather than the LMS discussion boards because of their unwieldy HTML authoring options and notification system. Additionally, students are more comfortable chatting openly about a problem, out of the gaze of the course lecturer. In fact students may use Facebook to formally or informally discuss academics (Lampe, Wohn, Vitak, Ellison & Wash 2011). Teaching academics should not feel insecure about this as it is a necessary part of the process of collaborative sense-making. Instead, they should respect their students’ need to have a private space where they can give and receive support without the fear, real or perceived, of being assessed or discriminated against. Discussions in the focus groups revealed that many students are seeking out additional study materials to supplement the course materials provided by educators. Many of these resources, available from sites such as YouTube or Vimeo, are often high-quality and may be produced by educators in different institutions. The quality of these resources and their value to learning is well-documented in many disciplines including nursing (Clifton & Mann 2011), computer science, literature, biology, philosophy, history, political science, and law (Gilroy 2010). These resources are available for every discipline and every topic within those disciplines. Fortunately, providers such as YouTube and Vimeo have mobile apps for download on every platform, and even their websites are mobile friendly. Educators could curate resources to ensure their quality and relevance and recommend these resources. In addition, they could allow students to recommend resources they have found. Higher education institutions in Australia, in common with those in the rest of the world, are grappling with the issues surrounding the implementation of mobile learning. Across the sector, institutional leaders are excited by the potential of mobile learning and the extraordinary affordances of rapidly evolving mobile devices. For most institutions, it is prohibitively expensive to supply devices to students, instead most opt informally for Bring Your Own Device (BYOD) strategies, leaving it up to IT departments to determinewhether and how this range of devices is supported. A project at the University of Southern Queensland has been undertaken to explore the rates of ownership of various mobile devices among the student population and how students are using those devices to support their study. In spite of the institutional ambivalence towards supporting a range of mobile devices and operating systems, many students are using their own devices to informally support their learning. Even so, educators have been reluctant to engage with mobile learning, sometimes going to the other extreme of banning device use in class. Given that students are already engaging with mobile learning, it could be that the adoption of mobile learning strategies rather than an embarkation into unknown territory for learners is even more so for educators. The realisation that students are already engaging in mobile learning and an understanding of how students are supporting their learning in this way may prompt educators to examine the way their courses and programs are delivered. The implications for teaching and learning may be far-reaching, requiring educators to move beyond traditional didactic methods which still predominate at most institutions. They will need to explore and flirt with alternative pedagogies such as social constructivism or connectivism to meet their students where they want to learn. This is most likely a daunting proposition for most educators, already overloaded with increased administrative duties and high teaching loads, and most likely lacking the skills and knowledge to implement mobile learning initiatives. Without tackling those meatier problems of pedagogy, this paper concludes with eight, entry level tactics to help educators embark on the mobile learning journey. Once comfortable with these methods, institutions may need to consider how educators can become skilled in mobile learning design and delivery. It could be that educators could engage in a large scale MOOC such as MobiMOOC (http://mobimooc.wikispaces.com/a+MobiMOOC+hello%21), thereby becoming one of a large community of practice that could provide not only learning in design of mobile learning, but also a community that could potentially provide ongoing support. Two of the authors of this paper participated in MobiMOOC in 2012 and are still in touch with many of the other participants, meet up with them at conferences and author papers together. A survey conducted at the end of the 2011 MobiMOOC indicated that some 82.5 per cent of the participants used what they had learned at MobiMOOC in their own contexts (de Waard et al. 2011). These ideas will continue to be explored as our project progresses. This project is supported through the Australian Government’s Collaborative Research Networks (CRN) program. Alrasheedi, M and Capretz, L F (2015). Determination of Critical Success Factors Affecting Mobile Learning: A Meta-Analysis Approach. TOJET: The Turkish Online Journal of Educational Technology 14(2): 41–51. Crompton, H (2013). The Benefits and Challenges of Mobile Learning. Learning & Leading with Technology, September/October 2013: 38–39. Deepend (2015). Australian mobile device ownership and home usage report 2014 In: Deepend, In-depth. Sydney, Australia: Deepend. Gilroy, M (2010). Higher Education Migrates to YouTube and Social Networks. The Education Digest, March 2010: 18–22. JISC InfoNet (2011). Mobile learning infokit. Retrieved from https://mobilelearninginfokit.pbworks.com/w/page/41122430/Home. Jobs, Steve . (2010). Thoughts on Flash. [web page]. Apple Accessed April 10 https://www.apple.com/hotnews/thoughts-on-flash/. Murphy, A, Martin, N and Farley, H (2012). Using e-readers to increase access to course content for students without Internet access. Paper presented at the Proceedings of the 29th Annual Conference of the Australasian Society for Computers in Learning in Tertiary Education: Future Challenges, Sustainable Futures (ASCILITE 2012). Pachman, M, Logunov, A and Quinton, S (2011). TELT evaluation framework – refinement of TELT survey instrument (2nd iteration). Sydney, NSW: University of New South Wales. Park, Y (2011). A Pedagogical Framework for M-learning: Categorizing Educational Applications of Mobile Technologies into Four Types. International Review of Research in Open and Distance Learning 12(2): 78–102. Rose, C (2013). BYOD: An Examination Of Bring Your Own Device In Business. Review of Business Information Systems 17(2): 65–70. Russell, C and Jing, Q (2013). Evaluating an institutional blended & mobile learning strategy In: Proceedings ascilite. Sydney, Australia: Electric Dreams. Sharples, M (2013). Mobile learning: research, practice and challenges. Distance Education in China 3(5): 5–11. Traxler, J (2007). Defining, discussing and evaluating mobile education: The moving finger writes and having writ …. International Review of Research in Open and Distance Learning 8(2) Retrieved from http://www.irrodl.org/index.php/irrodl/article/view/346. Wishart, J and Green, D (2010). Identifying Emerging Issues in Mobile Learning in Higher and Further Education: A report to JISC. University of Bristol.